This adventure will see you traveling back in time to ancient Egypt. Click here to play! You'll have to help the archeological team navigate the golden sands of the Egyptian desert while searching for ancient treasure. If you can make it through the adventure alive, you'll find yourself pulling in plenty of big wins! 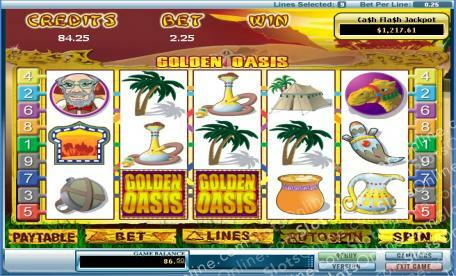 The Golden Oasis logo is the highest paying symbol in this game. Spin two to five of these across an active pay line and you'll get up to 10000 times your line bet. Also keep an eye out for the caravan train symbols. These will bring in up to 5000 times your line bet. While you're excavating the sands, you'll need to pay close attention to the head archeologist, as this bespectacled doctor will bring in up to 2500 times your line bet. There are plenty of other symbols to help you in your search for ancient treasure, including hookahs, tents, water jugs, canteens, palm trees and many more. You won't get far in the parched landscape without the help of the camel. This beast of burden will bring in up to 200 times your total bet if you can spin two to five anywhere on the board. He will also trigger the Treasure Cave feature if you can capture him three or more times. See if you can navigate these Egyptian deserts for a chance to unearth plenty golden treasure! The camel is a scatter in this adventure. If you spin him two to five times anywhere on the boad, you will get up to 200 times your total bet. Three or more will trigger a bonus feature. The camel triggers the Treasure Cave bonus feature if you can spin three or more anywhere on the board. During this game you will be taken to a secret cave filled with valuable treasure. You will have to pick a number of the pots of gold to reveal your bonus prize!